The formula for success in some neighborhoods is complicated. In the case of Henley, a high-end residential development now in its final phase of construction in western Henrico County, it’s not complicated at all. 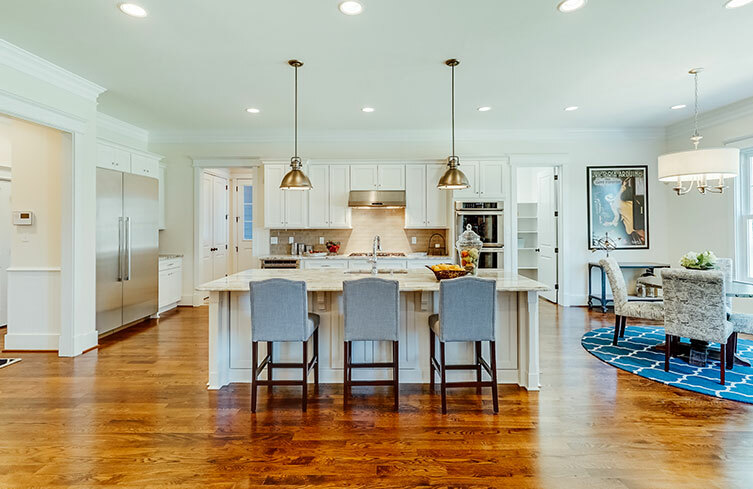 Estate homes on 1-acre lots with proximity to strong public schools and shopping and dining in Short Pump sum it up neatly. In fact, that’s the reason local developer Robert “Bob” M. Atack bought the 100-acre parcel of land back in 2005. Like many developments that got their start in the early 2000s, though, Henley, which is located off Pouncey Tract Road, ran into setbacks during the Great Recession. Orleans built 26 homes in Henley before filing for Chapter 11 bankruptcy in 2010. Their exit from Henley left the senior Atack, founder of Atack Properties Inc., facing a big decision. Richard Atack Construction began building custom homes in Henley in 2008, and it’s now the community’s sole builder. Its most recent homes there reflect Contemporary and Arts and Crafts influences. “As you’d expect with custom-built homes, each homeowner has his own tastes,” said David Ogle, a real estate agent with the Taylor Team at RE/MAX Commonwealth. So far, Henley has more than 50 finished homes, with an additional four houses under construction and two in the design phase. All six of the unfinished homes have gone under contract in the last 12 months, Mock said. “Currently, sales are steady,” she added. Twenty-six lots remain on the market. When built out, the community will have 79 homes. Among them will be some of the county’s largest single-family residences. The 150-foot-wide lots allow for a wide range of customizations, including six-car garages and three-car carriage houses, Atack said. And the 1-acre lots allow homebuyers to install private amenities such as swimming pools, tennis courts and basketball courts, as well as outdoor living spaces. “We get some really unique requests, and we make them happen,” Atack said. Prices for new custom-built homes in Henley start at $1.2 million. The community’s success goes back to that simple formula the senior Atack envisioned more than a decade ago, Ogle said. “Having estate-size lots in the heart of Short Pump with the best schools in western Henrico is what drives that neighborhood,” Ogle said.